Although Halloween memories are beginning to fade already, Beyoncé just got fans that much more excited about the holiday in retrospect. Taking to Instagram, the singer revealed that she did participate in the festivities this year, dressing as the iconic Lil' Kim. "Hip-hop would not be the same without our original Queen B," she captioned her post, showing off five different Kim costumes, with each highlighting a different era of the legendary emcee. In one of the photos, her husband JAY-Z can be seen sporting a costume in a similar homage theme, dressing as the Notorious B.I.G. Lil' Kim got wind of Beyoncé's costumes this year, reposting one of the images and saluting the power couple for absolutely slaying their looks and mannerisms alike. "This is so adorable and it's even cuter because Jay-Z and Biggie were friends and he has his mannerisms down pat I [heart] U Queen Bey and King Jay," Lil' Kim shared, reposting a photo from Beyoncé's Instagram. She later shared each look on her Twitter page, incredibly touched by Beyoncé's homage. 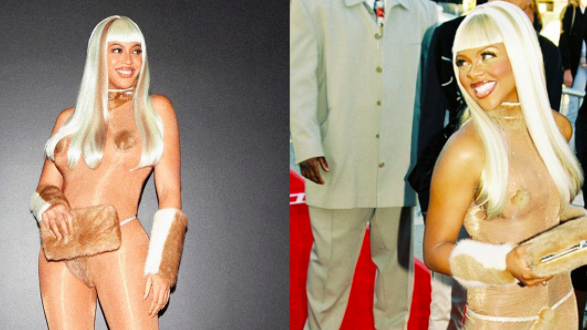 Take a look at how Beyoncé went all out and showed love to Lil' Kim this Halloween in the posts below.